Madewell Products Corporation manufactures a variety of cementitious and epoxy products for brick and concrete manhole rehabilitation and for the restoration of other structures in the sanitary sewer market. Some of these products are combined to form the Mainstay Composite Liner. 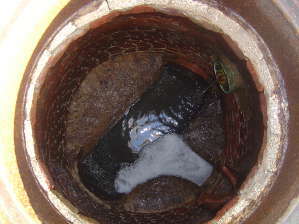 The Mainstay Composite Liner is a two-component manhole rehabilitation system consisting of a high strength restoration mortar, such as Mainstay ML-72 Microsilica Restoration Mortar, and an epoxy corrosion barrier coating, such as Mainstay DS-4 or 5 Epoxy Coating, that cures simultaneously to repair and protect brick and concrete manholes and other sanitary sewer structures. 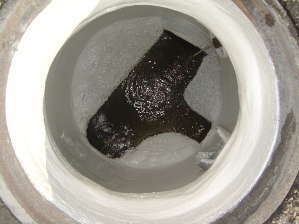 The mortar is first shot onto a new or deteriorated manhole substrate, and an epoxy topcoat is then immediately applied while the mortar is still soft. 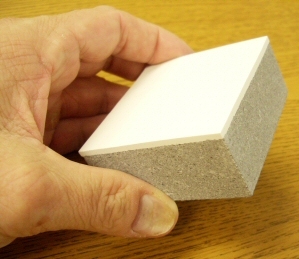 The simultaneous combination of these materials creates a monolithic lining that cures into a strong, highly corrosion resistant, and continuous surface, free of pinholes, holidays, and voids. The mortar and topcoat are tightly bonded not only to the manhole substrate, but also to each other. There is no wait time for the mortar to cure after it is applied to the manhole because the epoxy topcoat is applied while the mortar is still soft. Therefore, the manhole rehab system can be installed quickly, and deteriorated manholes and other structures can be repaired and put back into service in a single day. This reduces labor costs and saves time. The need to mobilize twice is also eliminated due to the concurrent application of the cement mortar and epoxy coating. This system is also specifically designed for use in moisture laden environments. Surfaces in manholes and lift stations are often continuously damp, making it nearly impossible to apply a protective coating alone. Cementitious products used in the Mainstay Composite Liner are properly applied when the surface of the concrete or brick manhole remains damp, eliminating the tedious task of drying the substrate prior to application. One main component of the Mainstay Composite Liner is Mainstay ML-72 Sprayable Microsilica Restoration Mortar. It is a high-build restoration mortar that can be applied to vertical manhole surfaces up to 5" thick, often restoring the manhole substrate to its original thickness. The cured mortar has a compressive strength of 10,000 psi, resulting in a restored manhole that is stronger than the original structure. Mainstay DS-4 and DS-5 are 100% solids epoxy coatings. These highly corrosion resistant coatings contain no solvents and may be applied to the manhole up to .125" (125 mils) in a single coat. The closeup photograph to the right shows a cross section of ML-72 mortar (gray–on the bottom) and DS-4 Epoxy Coal Tar (black–on the top). Note that the two products are both physically interlocked and chemically bonded.